Flint Township Police Officer Steve Parker died in a traffic accident on Friday, Jan. 15. FLINT TWP. — Funeral services were held on Tuesday for a Flint Township officer who died Friday, January 15, in an early morning traffic accident on the freeway. Steven Garrett Parker, 48, of Fenton, a 15-year veteran of the township police force, was killed when the Jeep he was driving crashed into the rear of a semi-tractor trailer, according to a report from the Michigan State Police (MSP) Flint Post, which is investigating the crash. The crash occurred at about 2:50 a.m. on southbound I-75 just north of Maple Road, resulting in the freeway being closed for several hours. Parker, who was alone in his vehicle, sustained fatal injuries and was dead at the scene, said David A. Kaiser, MSP public information officer. A MSP traffic crash reconstructionist and motor carrier officer assisted troopers investigating the crash. State police also were assisted at the scene by Flint Twp. Police, Mundy Twp. Police and the Genesee County Sheriff Department. The crash remains under investigation. Parker was born January 9, 1968 in Detroit, graduated in1986 from Fenton High School, was a veteran of the U.S. Army and received a Bachelor degree from Saginaw Valley State University. He and his wife of 16 years Collin have five children, ages 7 to 15. He is being remembered as a loving husband and a fantastic father who enjoyed karaoke, camping and playing pool. 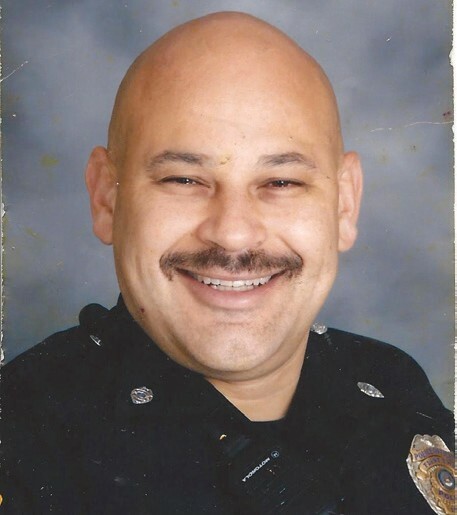 His service as a police officer cut a broad swath in the community including stints at Genesee Valley Center shopping mall and Carman-Ainsworth Schools. He served as the Flint Township Police Liaison Officer at Carman- Ainsworth High School from 2008-09 to 2011-12, said Debbie Davis, CAHS principal. He also was the school resources officer at Randels and Dye elementary schools and at Atlantis Alternative High School. Officer Parker was highly respected and served as an integral part of the Carman-Ainsworth team during his assignment, Davis said. Parker also served as an educational guest speaker for students presenting the 4th Amendment (Search and Seizure) in Civics classes and elementary presentations for law enforcement awareness. “We were devastated to hear of his loss, not only for his wife Collin and five children, friends, but also for the entire Flint Township community where his presence will be deeply missed,” Davis said. The CAHS staff will be collecting donations for Parkers Memorial Fund to help his family with living and educational expenses and will hold a “Dress in Blue to Support Officer Parker” tribute day later this spring. A GoFundMe page set up for Parker’s family at www.gofundme.com/bjjctmqs had raised $15,305 as of Tuesday afternoon. In addition to his wife and children, Parker also is survived by his mother Myra Church of Burton; three brothers, Mike Wade, Christopher Shoemaker, and Mark Timocko; uncle and aunt, Sean and Jenny Dennison of Swartz Creek.